For several years, bestselling author S. Michael Wilcox has been a favorite presenter at BYU Education Week, Time Out for Women events, and adult religion classes. His popular talks on CD represent some of his most inspiring and profound work and have generated countless requests for printed transcripts of these classic addresses. Now these timeless talks have been transcribed, edited by the author, and compiled into a single volume. Included in this volume are the classic talks Walking on Water; The Jesus We Need to Know; Of Lions, Dragons, and Turkish Delight; The Fourth Watch; Seeing as God Sees; When All Eternity Shook; Your Faith Becometh Unshaken; and Taking the Temple with You. So glad they put these in a book! I have most of Brother Wilcox's talks on CD's and love them all! He is such a gifted teacher and truly makes the scriptures come alive. There have been many times when I have started and stopped a CD repeatedly so I could write down the scriptures and concepts that he was sharing. I was thrilled to see that they put them all in book form. I can now mark this book up and take the time to read and reread and ponder the things that touched my heart. Highly recommend! We all have trails some harder than others. A good book to help ponder ideas of where I am headed and where I need to be going not to give up and to find joy in the journey. Alot of good parables of Narnia and I would like to thank brother Wilcox for his book! •	The messages of Jesus Christ. •	How to avoid being blinded as King Noah. •	How to make your faith unshaken and other various topics. 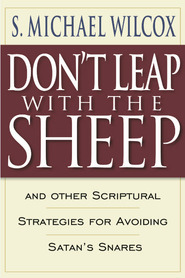 One of the book’s strengths was the clarity that Michael Wilcox presents Jesus’s ‘walk on water’ statements. An example of this clarity is when he presents the doctrine of performing the impossible things that God commands us to do. He gives the example of how Nephi was commanded to build a boat and his brothers thought that he was foolish for even trying. Wilcox uses a scripture in which Nephi says, “If God had commanded me to do all things I could do them” (1 Nephi 17:50). The author then goes on to say that this applies in any situation whether it is accepting a calling or forgiving others. His explanation was clear to me and has helped me understand this doctrine. This was the case for many of the other doctrines found in the book. Despite its strengths, this book does have a weakness. One thing I found to be a weakness was the wording that caused some confusion. One such part was in the chapter about making your faith unshaken. Wilcox talks about faith and how we need a solid foundation in case we encounter faith shaking experiences. He then goes on about talking how to build a solid foundation. Here the wording gets a little confusing because he uses abstract words and ideas that take more time to fully comprehend than normal. Overall, Walking on Water and Other Classic Messages is definitely one of the best books I have ever read. I would recommend this book to anyone looking to strengthen their faith and learn more about Christ. I enjoyed this book every time I picked it up. It will bring enjoyment to you as it has brought enjoyment to me.